You know how bloggers will talk about an event they have coming up and it sounds so exciting and you feel just a little bit envious of all they are doing and all the fun they are having? Well. Guess what. There is a TON of work involved in all that ‘fun’. And you know how said bloggers will promise you lots of pics of the event – they are going to share it all with you so you can experience it and have fun too! And then. They are so busy and so exhausted they don’t even have time to get the camera out and they end up with no pictures to share and it takes them weeks to even get off the couch and start sharing anything about it?! Yeah. That just might be ME this weekend. Whew. Truck got packed – all 17ft of rented space. Well, you could toss a bunch of pouffes or something into the empty air space above some of the stuff but that think is so packed out. Oh I’m sure if you had, say a week or so to pack you could pack WAY more in but we didn’t have a week or so. We ran out of daylight. I ran out of strength about 2 pieces of furniture in. Next time I will hire some teenage boys to load! Except there won’t be a next time cause Iamneverdoingthisagaineverevereverinmyentirelife. Yep. I’m to that point. You don’t want to know how many times I wanted to call the whole thing off during the loading process. I had no idea how much stuff I had since it was stashed in the basement, back porch, our bedroom, living room, laundry room, bathroom, dining room, and sewing room. Get it all in one pile and it is overwhelming. Anyway. I wanted to share one little project I managed to get done for The Vintage Marketplace – a project besides painting furniture. 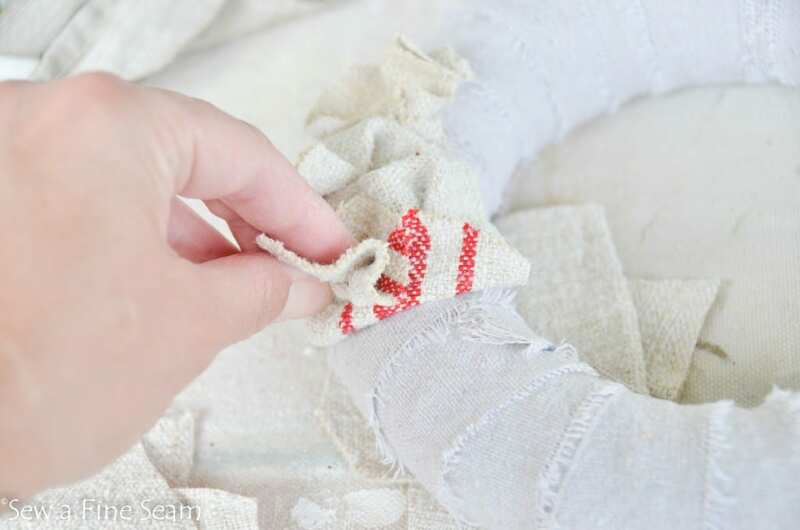 It involves one of my very favorite things – Antique European grain sacks. I found a couple foam wreath forms at Meijer last weekend – on sale for 1.50 each. 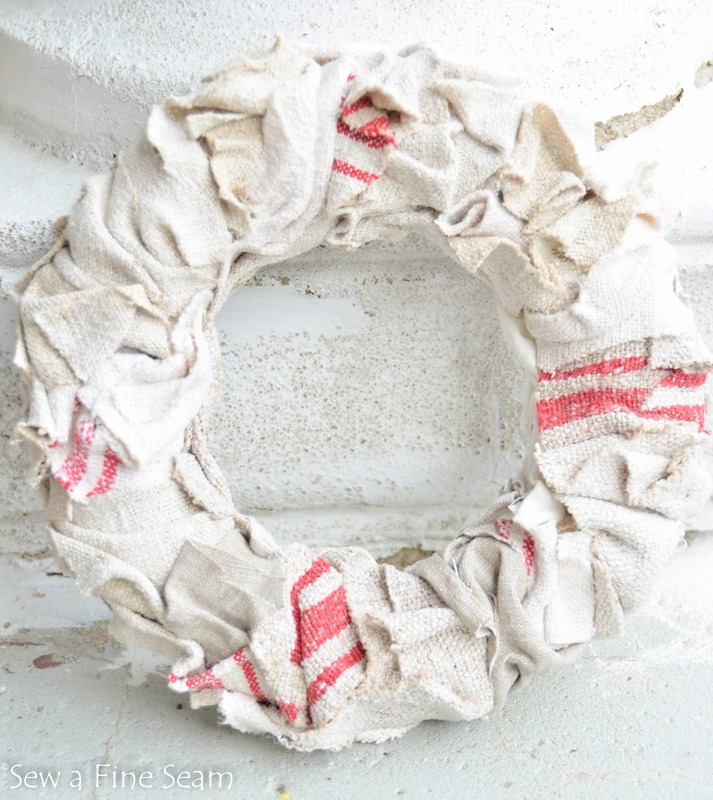 I wrapped each of them with strips of a drop cloth scraps, securing the ends with hot glue. Then I took smallish pieces of grain sack scraps and hot glued them all over the wreath, tucking and hot glueing wherever I thought it looked good. 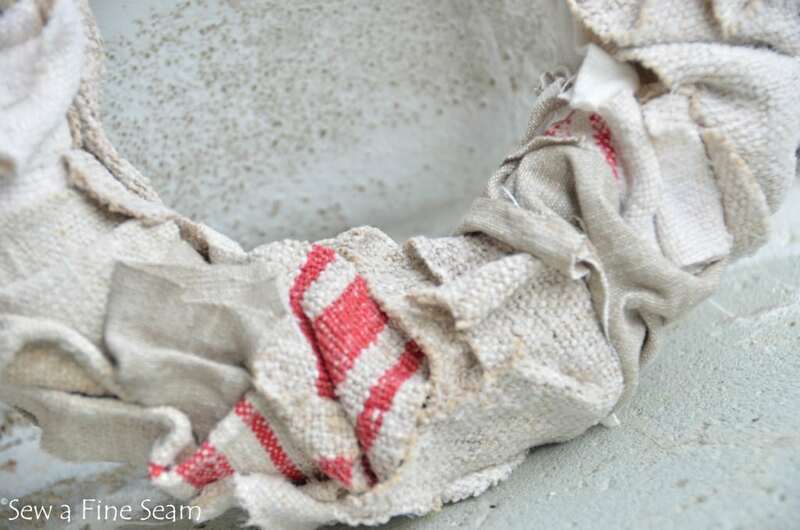 I kept adding scraps of grain sack till I liked the look. This one had bits of red here and there and the second one I did had blue. I’ll have to try to get a pic of that one too. I really hope I have time to get pics of my stuff tomorrow as I set up because a lot of the stuff I don’t have after shots of yet. I thought I might do it while we loaded but that is so laughable I could roll on the floor 😀 packing up took all the time and energy I had plus some. Love it! You really do need a store front, Jill! Then maybe you won’t have to drag all your beautiful things around! Wish I could come this weekend but not going to make it. Bummer! Love how that wreath turned out! 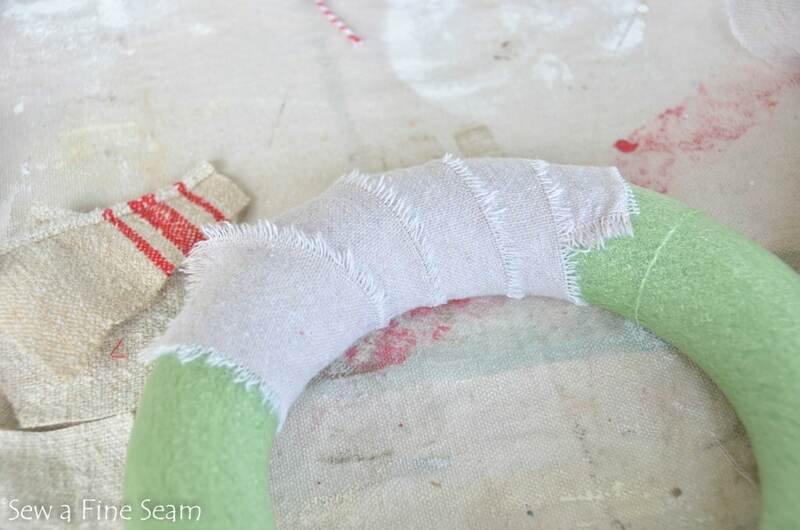 I could actually do that since it is a no-sew project! LOL. Good luck this weekend with your huge sale. 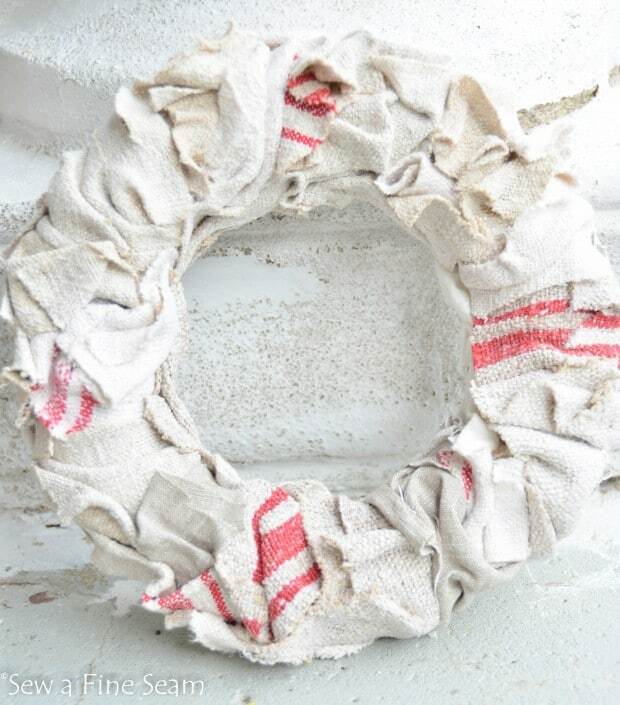 LOVE this use of scraps-what a beautiful wreath. I think it will be worth it in the end. Your stuff is gorgeous! So pretty, Jill! You make it look so easy!! I love it Jill! It’s fabulous! Have a great weekend! or any time. Love it!